I don’t think that it’s any big surprise that the book “Julie and Julia” by Julie Powell was a big inspiration for my blog. 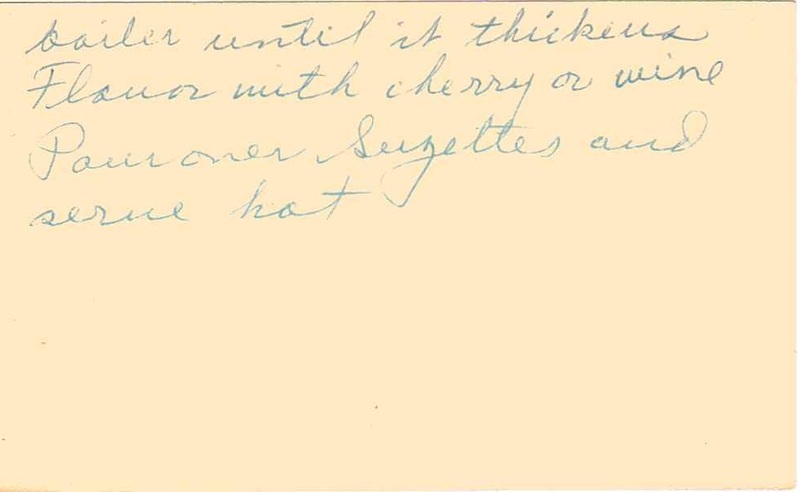 Ironically I read it right before I stumbled upon The Found Recipe Box at an antique show. I immediately connected with Julie for many reasons, but mainly because she was at a point in her life when she felt lost and was facing some big life decisions. At the time I was unemployed and Ryan and I had put our plans for the future on hold, including starting a family. It felt like someone had pushed the pause button on our lives. But reading Julie’s book helped. She wrote about her situation with blunt honesty and humor. She creatively worked her way through a challenging time and accomplished huge goals that she had set for herself. I felt empowered and encouraged as I turned the pages of her book and when the little lost recipe box came into my possession; I knew it wasn’t by chance. However, when I contemplated starting the blog, I didn’t want to just copy what Julie had already done. I wanted to take those recipes and share my own stories. And I didn’t want to set a timeframe in which to complete the project. Well, here I am, three years later, and still nowhere near completion. But that doesn’t matter because I’m not giving up. Life has changed a lot in the past three years: I’m working full time and I have a beautiful little girl who gets all of my attention during our waking hours together – and she is at that age where she is constantly exploring and into EVERYTHING so my eyes rarely stray far away from her general vicinity. This leaves little time to do much else other than make dinner, do laundry, clean and pass out. But once again, I find myself in search of a connection. I found work after two years of unemployment, but it was a huge step back from where I was and I’m not even in the same field. There are days when it’s easy to get overwhelmed by the stress of barely getting by. Once again, we feel as though our lives are on pause. It reminds me of the summers we used to spend in Florida visiting my mom’s family when I was a kid. My dad, brothers and I would swim in the Gulf of Mexico together and would challenge ourselves to tread water as long as we could. We’d paddle out until we couldn’t touch, then beat our arms and legs against the current and constant waves until our muscles burned and we felt as though we’d sink. Then, just before our tired appendages gave out on us, we’d let go and float on our backs, letting the salt water hold our exhausted bodies up until we were ready to dive back in. I’m ready to dive back in. And once again, I’m looking to Julie for inspiration. Luckily, I have not had to experience the crustacean murder, but I can relate to what she’s saying here and she’s right, not everyone gets a rabbit hole. And I’m so very, very thankful that I am one of the lucky few who do. When I made the spreadsheet of all the recipes in the box, I tagged a few that I would like to make and dedicate to Julie Powell for her inspiration. 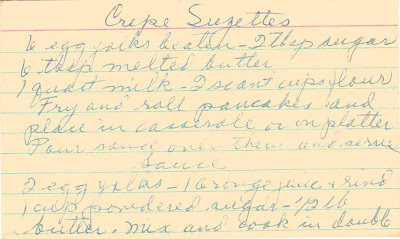 And I’m honored to post one of those recipes now: Crepes Suzettes. Crepes were one of the recipes Julie struggled with and, after lots and lots of practice, eventually mastered. After making these, I can completely understand her frustration with the delicious little devils – they are nearly impossible to flip! After several attempts, I ran out of batter and had to give up, but regardless of how mutilated my poor little crepe was, it was still heavenly to eat. I did make a slight change to the recipe, however. We were at a festival this summer and saw banana/Nutella crepes and the combination had been swimming in my head ever since, so I had to try them. If you get a chance to taste these, don’t pass it up. They are truly divine. So thank you Julie, for having the courage to share your story. I know that’s not easy. But hopefully you know how much that means to all of us out there looking for the right ingredients to turn this little thing called life into a delectable five-star meal. And I also want to give a special thank you to all of you who have stuck with me through this journey. It means the world to me to have you share in this adventure and I love hearing your stories! So thank you, thank you, thank you! Hang in there, we have a long way to go. I'm so glad you're still keeping at it! I LOVE your posts, and the photos make me so hungry! I stumbled across your blog last Christmas when I was doing my baking and looking for a good, old-fashioned lemon bar recipe. 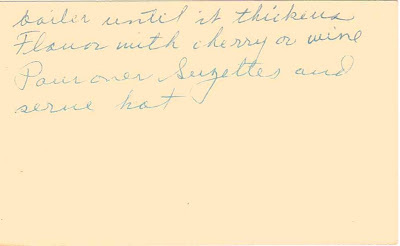 I'd love to find an old box of recipes. My mom's is mostly clippings from the backs of soup cans from the mid 60s. Heh. 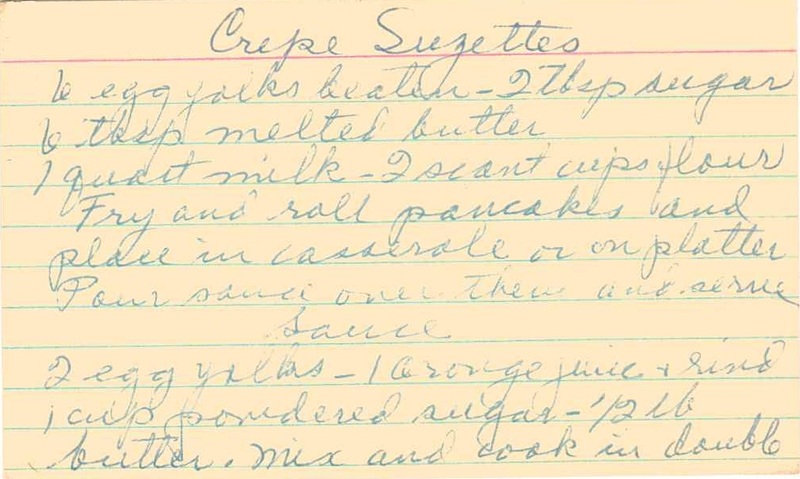 I used to make crepes every Sunday morning when I was a kid. You're right. Hard to flip. Takes a lot of practice and a good pan. I'd recommend one of the crepe pans with the low walls. Hmmm... I should really try them again. I literally haven't made them in about 30 years. The Nutella and banana combo sounds amazing. I used to squeeze fresh orange juice and sprinkle a little sugar on mine. This is very Good recipe. Keep going on with your effort to write more posts.